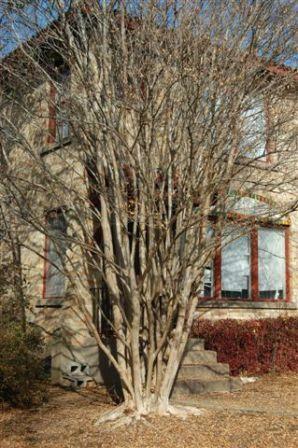 Crape myrtles tends to have large, dramatic flares if exposed properly. Mulch, by the way, is almost as damaging as soil when covering the flare. Starting when they are young is important. Growers really need to do it. You can do it at home by removing all canes but one. Most trees are planted too deep in the ground these days. Far too many crape myrtle are too deep in the containers and then are set too low at installation. When emerging out of the soil like fence posts, the tree... has somewhere around 6-10" of soil on the flare and trunk. This shot is a good example. Another warning is to try to avoid multi-trunked trees like this. What the grower did is stick three small trees together in the same container. Big problems down the road.